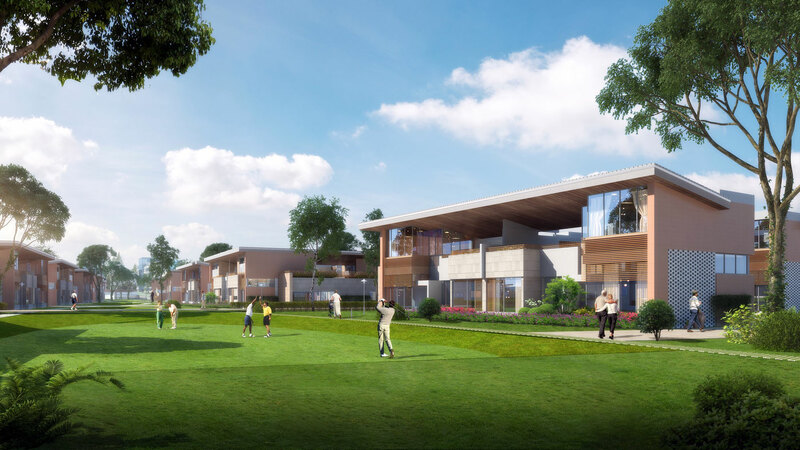 "A Great Place for the New Start of Life"
Cordogan Clark & Associates, teamed with The Davis Experience of Phoenix, was one of three firms invited to enter an international competition for the design of a new Continuous Care Retirement Community (CCRC) on Chongming Island. 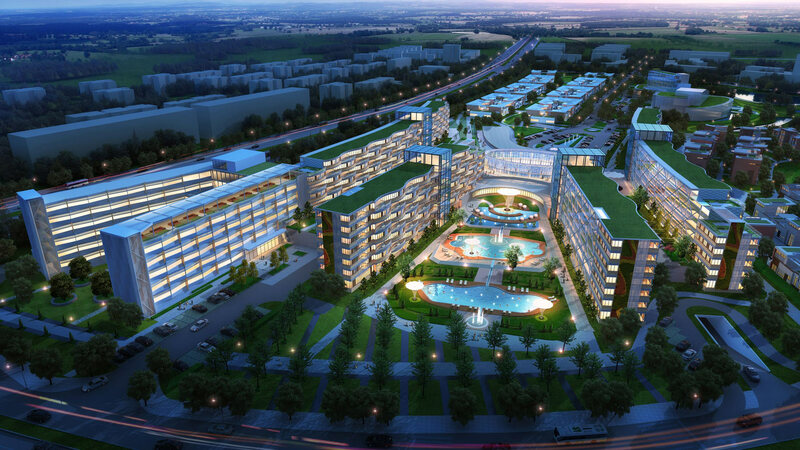 Our project for the new CITIC Chongming Island CCRC is a state-of-the-art retirement community that integrates international "best practices" in a spectacular resort-style setting. It is designed in harmony with its unique Chongming Island setting. This innovative lifestyle project includes a combination of independent living, assisted living, as well as skilled nursing services available to residents all on one campus. It offers a daily choice to extensive amenities. It provides the full spectrum of care, to provide seniors with the comfort that they can live out their years in one community, without having to move as their needs for assistance and health care increase. This "next generation" Continuous Care Retirement Community is a lifestyle community that offers residents a variety of social and recreational activities to allow entertainment and social engagement, as well as diverse dining options, housekeeping, transportation and, of course, health care services, all in one community. Yet those who unaware that this is a retirement community will likely view it as a destination eco-tourism resort with hotel. Its architecture is beautifully positioned in a gardenlike-setting, similar to the best eco-resort planning. Pedestrian and vehicular traffic are carefully separated, so that people may easily walk from their residences without being interrupted by vehicle traffic. 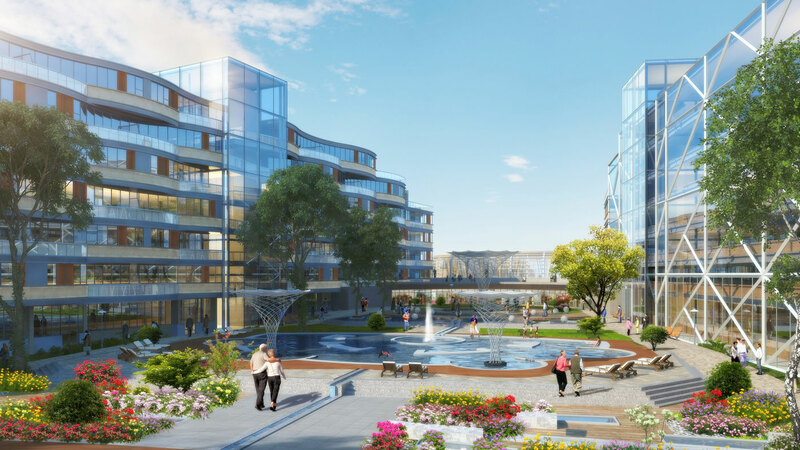 Community paths connect the central multi-use building with all individual residences. Parking is mostly underground. The building structures are low to the south, and gently slope upwards towards the north end of the site. This creates an architectural massing reminiscent of an Italian hill town. The architectural style is unique: Elegant, Concise, and Exquisite. It is designed to capture the excitement of its location on the world-class ecological Chongming Island, and its proximity to downtown Shanghai. As such, it creates its own style, very contemporary yet not specifically western or eastern. It is designed to blend with nature while creating a stunning effect. 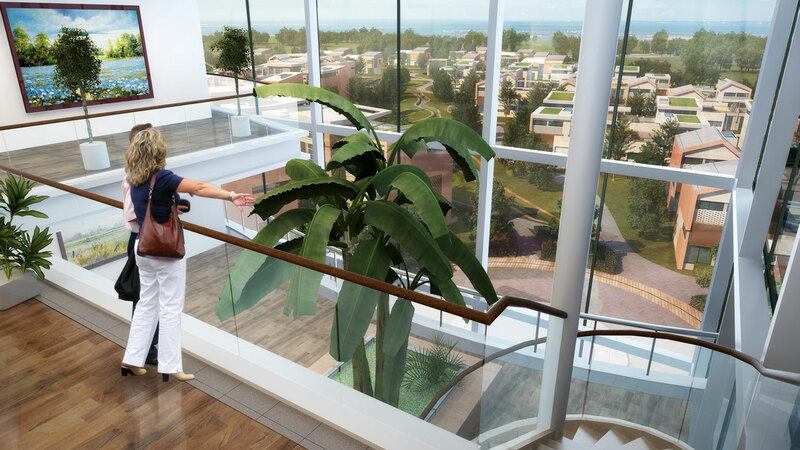 The diversified architectural design enlivens the landscape, creating special places, avoiding monotony, allowing seniors to easily identify their special residences. The design is evolutionary. Having researched CCRC best practices, this design goes beyond them in evolving a new CCRC community. 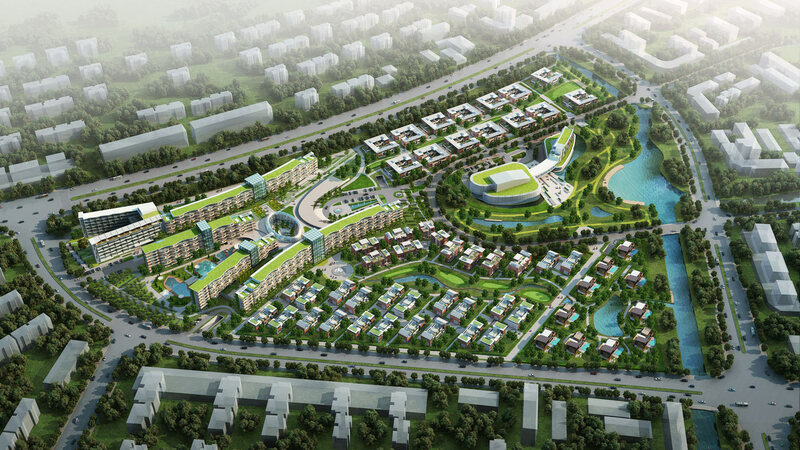 It creates a special new ecological type of CCRC development that is uniquely suited to Chongming, but will also be emulated elsewhere. It is designed to create a "sense of place," a place where people want to live. The design uses the natural site configuration to "de-institutionalize" it. Smaller dwellings are located in the foreground, to the south of the site, where the site narrows into two outreaching arms. These can be seen as independent neighborhoods, and their connection to the supporting functions to the north is blurred. Also to the south, a lively entertainment complex, open to visitors and the public, encourages visits by family members and others, and brings intergenerational vitality to the site. Adjacent to the entertainment complex is a hotel to support overnight and longer visits. Direct access to these foreground neighborhoods also means that residents and visitors can easily come and go without having to pass through the more supportive care facilities towards the north. This site design means that are actually more connected since they are part of a larger community fabric, as opposed to part of a (segregated) campus. This design breaks down campus boundaries and provides easy access to and from the site, allowing residents to more easily integrate with the surrounding Chongming amenities, transportation, as well as Shanghai. This deinstitutionalizes the CITIC senior living CCRC environment. 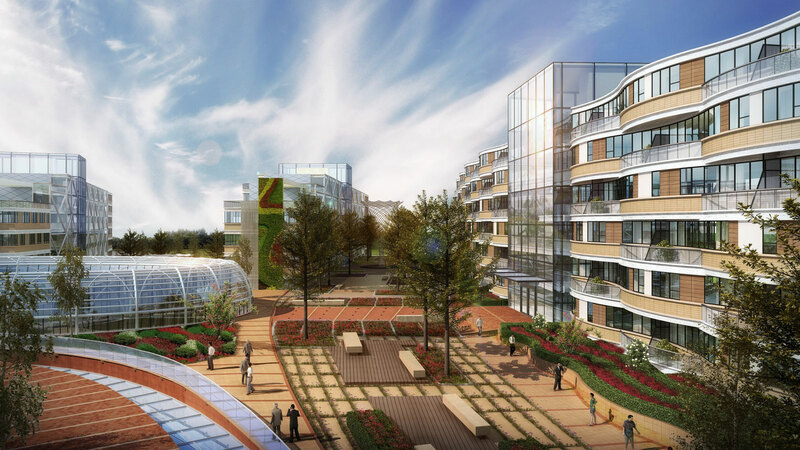 This represents a new approach in CCRC design, which enhances residents' lives and better allows for aging-in-place. Older adults can have better choices and greater continuity with where and how they lived prior to moving to a "senior environment." 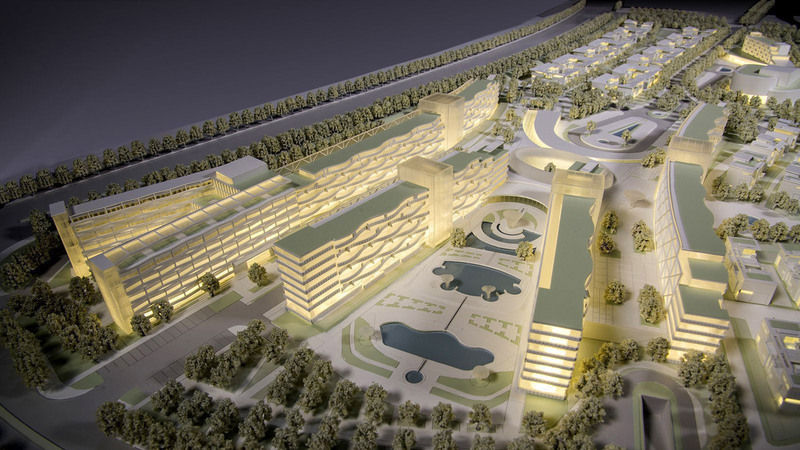 The CITIC Chongming Island Retirement Community (CCRC) is designed to the highest LEED Platinum standards, to create a sustainable, energy efficient development that embodies the highest green values. It includes LEED Platinum buildings in a seamless combination of architecture and landscape. A series of courtyards, sunken gardens, ponds, and planted mounds creates a circulatory system that regulates and redistributes storm water throughout the site. In areas where pavement is required, permeable materials such as local river stones, gravel, open-joint stone pavers, grass-crete, and compressed sand pavers are used to absorb water and naturally filter it. Throughout the project, the design provides multiple common spaces that either open up to or are located outdoors. By maximizing connections to outdoor spaces and providing appropriate shading to protect residents from the sun, residents can take advantage of true indoor-outdoor living. The main multi-use building's long, narrow floor plate ensures that people inside can rely mostly on daylight for illumination. Large operable windows reduce dependence on mechanical ventilation, especially during cooler months (November to April) when natural ventilation can take over 60 percent of the time. Operable windows can also cut electrical energy consumption annually by about one-quarter or 5 kWh per square meter. The architecture is also designed to help mitigate high heat and humidity and small temperature variation during the summer months. To mitigate the effects of hot, moist summer weather, the dynamic gently-curving design of the main building welcomes and embraces breezes, to create more pleasant micro-climates. High-performance glass, with two low-e coatings and a custom-designed system of louvers protects the curtainwall and glazing from the full impact of the sun. To get the most protection while maximizing daylight and views, each of the building's faces is specifically designed with fixed and operable louvers and the size of the openings in the louvers adjusted to the façade's solar orientation. On the main mixed-use building, generous south-facing balconies also provide sun control in the form of solar shading. Extensive use of green roofs also provides natural cooling and shading, for better energy efficiency and to reduce "heat island" effect. Through a combination of shading performance and a system of louvers and operable windows, the architecture achieves very comfortable conditions with natural ventilation during the winter season. At the atrium center of the multi-use building, the structural ring which functions as a sculptural element is also used to create a convective stack effect that pulls cool air from the underside of the structure as it releases hot air out from the top. Similar convective currents are designed elsewhere into the main buildings. Renewable materials are used throughout the project. For example, bamboo for doors, floors, and furniture, and carpet tiles with vinyl backing made from recycled carpet and manufacturing waste. All paints, finishes, and adhesives in the building have either few or no VOCs. To conserve drinkable water, the building is equipped with low-flow, high efficiency plumbing fixtures and waterless urinals. In addition, dual-flush toilets use recycled graywater. Outdoors, rainwater filtered by the bio-swale system is used to irrigate the grounds. The central hybrid multi-use building combines different functions in one complex. Parking is mostly underground. Because the multi-functions occupy one long building, the scheme offers flexibility in terms of the amount of space allocated to each segment. Our HVAC system, as described elsewhere, is a highly energy-efficient geothermal based system, using the earth's natural temperatures as a "heat source and heat sink" to heat and cool the internal spaces. This connects to radiant floor slab system throughout the environment, so that floors are comfortable during winter months. To reduce dependence on conventional energy sources, an optional 15,000 SF of photovoltaic panels may be installed on the main multi-use building's roof. These solar cells could provide 12.5 percent of the headquarters' total electricity needs. The site and landscape design is also used to help temper the climate and the architectural environment. The architectural setting is laced with waterways that that provide bio-swales and water retention and irrigation, connected to adjacent streams. These establish a restorative ecology that minimizes run-off, erosion, and environmental damage. Many fundamental LEED and Sustainable design considerations also correlate with optimal feng shui design. Chief among these is a primary south orientation for all main living spaces. The main multi-use building's long, gently curved narrow floor plate that ensures people inside can rely mostly on daylight for illumination, also captures gentle breezes to help mitigate high heat and humidity and small temperature variations during the summer months. The gentle architectural massing slopes upwards from the south to the north, further optimizing solar exposure, optimal views, and natural ventilation, reducing reliance on artificial lighting and mechanical ventilation. The gently curving architectural layout enourages sea and land breezes to pass through the gardens. The landscape is bracketed with pools and walkways. At night a walk through a lush landscape of flowering tropical plants will mix the smell of jasmine with the colorful glow of the residences floating above. This unique, highly-functional architectural design in its special ecological setting creates a quiet, comfortable, and romantic environment. 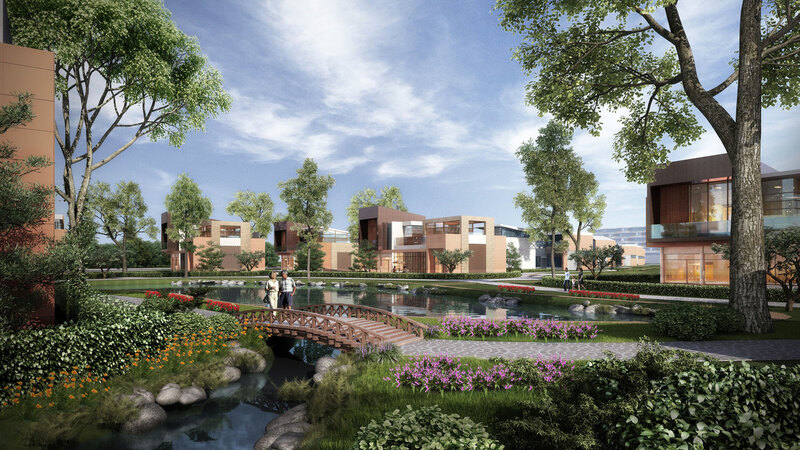 Designed in harmony with China's new green ethos, it is a world-class oasis readily accessible to Chongming Island's many amenities as well as to downtown Shanghai. 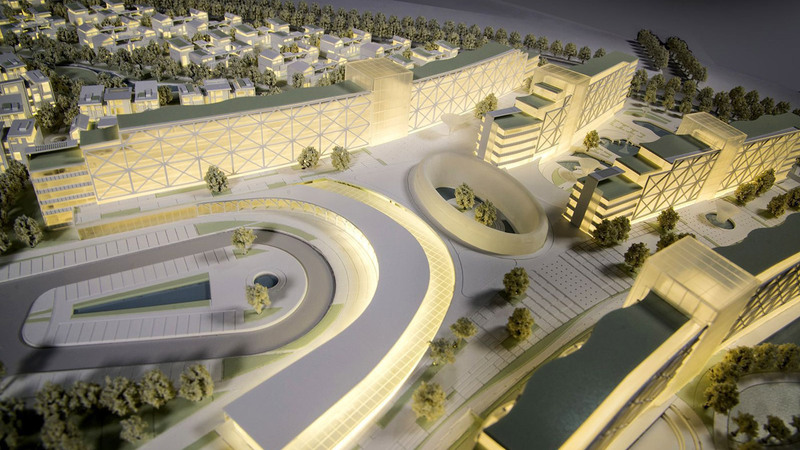 It is designed to create a community continuum, to smoothly allow increasingly supportive care. "Building the Future," it provides a new world benchmark for best quality state-of-the-art CCRC development.